D&D Painting is Westlake Ohio #1 Top Quality and Professional Residential Housepainting Contractor 216-246-0317, offering Interior Painting and Exterior Painting Services, Drywall, Power Washing, and more! (Quality, Color, Commitment!) At D&D Painting we believe in work done right at affordable price. We can work around any kind of budget and take pride in our work. We use only quality paints. We don't cheat on quality. View more About us and our Family of Painters. We use top of the line products like Benjamin Moore, Sherwin Williams, and ICI Dulux for all our house painting services. With our outstanding customer service, we take pride in being unmatched by others, and yet, being the most affordable home painting company to hire. D&D Painting, a Cleveland House Painting Contractor services the following areas: Cleveland, Cleveland Heights, Bay Village, Berea, Lakewood, Middleburg Heights, Rocky River, University Heights, Westlake, and communities throughout Cuyahoga County, Lake County, Lorain County, and Summit County, Northeast Ohio. Contact us regarding our services, and Free Estimates. Questions regarding our painting services can be found on our﻿ FAQ Page﻿. 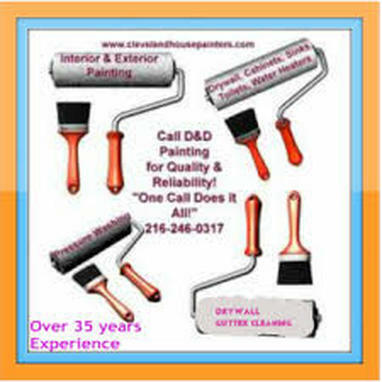 Proudly painting Cleveland homes and businesses for over 35 years!